This website is dedicated to persons in recovery from alcoholism, drug addiction and other addictive disorders - and their family members - together with addiction treatment professionals. It is designed to introduce you to the many benefits associated with embracing a wellness-oriented lifestyle as an integral component of your recovery program. 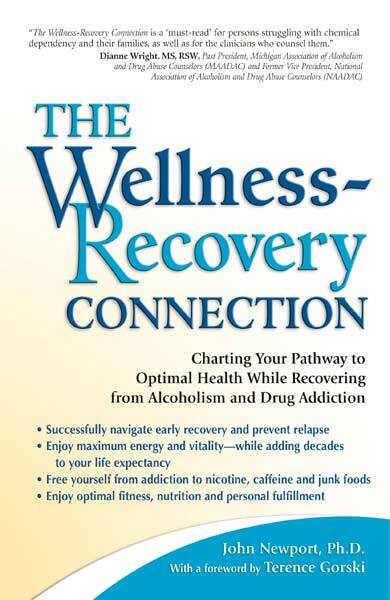 The materials highlighted in this website draw upon Dr. John Newport’s groundbreaking book The Wellness-Recovery Connection: Charting Your Pathway to Optimal Health While Recovering From Alcoholism and Drug Addiction. As you are well aware, chemical dependency is a serious disease with devastating consequences. Alcoholics and addicts whose diseases go untreated suffer major health consequences - including severe damage to their livers, hearts and other vital organs - often dying decades before their time. What you may not be aware of is the fact that millions of people in recovery - perhaps the majority - also shortchange themselves of years of joyful living as a result of their nicotine addiction, compulsive over-eating, junk food addiction and other self-destructive behaviors they carry with them into their recovery. Fortunately, you can use the tools of wellness to take charge of your health and strengthen your recovery. A wellness lifestyle and recovery from chemical dependency go hand in hand. By embracing a wellness lifestyle, you will experience the many joys of recovery in “full spectrum Technicolor”! Information on talks and workshops on the wellness - recovery connection, presented by Dr. Newport. An Expanded Menu of services for treatment professionals and programs highlighting on-site trainings and program consultation , and wellness and recovery services for program alumni. A NEW Counselor Wellness section. Embrace the full benefits of wellness and recovery - and enjoy the journey! As you move forward in charting your pathway to optimal health, you may use the contact form to share your own journeys in wellness and recovery. To your health!